Calendar@: These 5 Candidates Need To Sign The Contract! Send event invitations to calendar@peninsulateaparty.org to include them here. These 5 Candidates Need To Sign The Contract! The 2014 primary cylcle is in full swing and while we have had some great success getting new signatures, we still have a ways to go! Below are 5 candidates that top our list and we need your help! Pick up the phone now and demand that the below candidates sign the Contract From America located at www.ContractFromAmerica.org! When these leaders sign their names to a document like the Contract from America, they take it seriously. It's a commitment from them to stay true to our shared belief in individual liberty, limited government, and economic freedom. Make sure they go to ContractFromAmerica.org today and sign! Whether you have time to call and/or tweet just one person on this list, or if you can contact them all today, please take a moment to do so right now. Thank you for your continued support! Pentagon's "war games" scenario coming true? We need YOU to sign the Contract from America! MAJOR News Out Of Georgia! We won in the House. Now for the Senate. Will The Senate Gain TWO Contract Signers?! We are using Google Calendars which is based on the iCal format. Simply put, if you create a calendar event in your calendar and send an invitation to these calendars they will be posted automatically. I recommend getting a Google account and your own Google calendar. Google Accounts - http://www.google.com/accounts If you don't have a Google Account you can create a new account using your current email address even if it's not gmail. (You do NOT need to get a Google gmail,) Once created or if you already have a Google Account you can always add other emails that identify you to that same account and continue using the same Google resources. You may already have a calendar that will work for this like the iCal that comes with most Apple Mac computers and with Android based phones or if you have an account with a domain that uses Google calendars (like PeninsulaTeaParty.org, YorkTeaParty.org, or PoquosonTeaPartyPatriots.org.) If not start your own calendar at http://calendar.google.com. Now once you have a calendar, you are able to create events in your calendar and send them to these calendars by putting the calendar's email address "Add guests" box. To see and edit the shared PeninsulaTeaParty.org calendar from your calendar click on "Add" under Other Calendars in the left side bar of your calendar and choose "add by url" then paste in this http://www.google.com/calendar/ical/alexanderofyork%40peninsulateaparty.org/public/basic.ics or add a friend's calendar and use alexanderofyork@peninsulateaparty.org in the email box. Other public calendars are patriots@ofVA.US and when@canwedo.org. If you are an editor of this calendar it will be listed in the Calendar: box when you are creating or editing an event. If you are not yet an editor please send an email to the calendar address with the subject "Make me an editor." Adding an event simply starts with clicking on the date. You can save fill in the "what" and [create the event] or edit event details. In the detailed edit you can put the specific time, fill in the location address which will give a map link, and fill in as much detail description as you need. 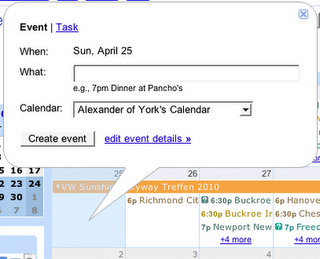 Then don't forget to add guests including other calendars that you want your event to appear on. If you are allowed to edit other calendars you will see them as alternative choices to which calendar to create the event for. If you have the calendars you want already in your Google calendar you can also try this site http://www.google.com/calendar/embedhelper to generate the html to copy and past to your site.